english name "Gray-Capped Little Caesar"
1. Amanita pachysperma, ca. Kingston, Rhode Island, U.S.A.
intro This very small, gray-capped species may be easily overlooked because amanitas are not expected to be so small. cap This very small, gray-capped species may be easily overlooked because amanitas are not expected to be so small. The cap is 15 - 27 mm wide, darkest in the center, and has marked grooves extending from the margin 40% of the distance to the center. gills The white gills are narrowly adnate attached or barely free, and more or less crowded. The short gills are often squarely cut off and unevenly distributed. stem Its white stipe (23 - 50 × 3 - 6 mm) has a little, fragile skirt at first; but this may be lost with age. The volva is membranous and cup-like. odor/taste This species is odorless in the experience of RET; however, Singer thought that it had the odor of old wine casks. The taste is not recorded. 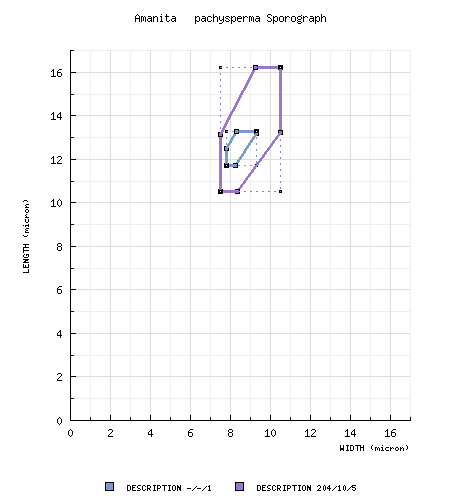 spores The spore measure (9.5-) 10.5 - 16.2 (-20.0) × (6.0-) 7.5 - 10.5 (-12.5) µm, broadly ellipsoid to elongate, rarely cylindric, rarely subglobose, inamyloid. Basidia bearing clamps. author G. F. Atk. 1918. Proc. Amer. Philos. Soc. 57: 354.
type studies (as "pachyspora" [sic]) Jenkins. 1982. Mycotaxon 14: 244.
revisions Tulloss. 1993. Mycotaxon 49: 457, figs. 5-8.
intro Figures from the original article (Tulloss 1993) are inadequate; therefore, none are presented here. This page reports original research by RET. The above text has been extracted (with slight editing to remove clumsy phrases and update the information) from the revision of A. pachysperma by RET (1993). pileus 15 - 27 mm wide, light gray to gray (5B2), sometimes with dark gray disk, convex and umbonate at first, then planoconvex, finally with central depression, dull, slightly sticky or dry; context white, unchanging when cut or bruised, 1 - 1.5 mm thick, thinning rapidly to a point about half-way to margin, then a membrane; margin sulcate to tuberculatestriate (0.35 - 0.45R), nonappendiculate, sometimes slightly decurved; universal veil absent or as an irregular patch, membranous, white, often with its surface impregnated with sand. lamellae narrowly adnate or adnexed to barely free, subdistant to subcrowded to crowded, pure white both in mass and in side view, 2.5 - 3 mm broad, occasionally anastomosing; lamellulae truncate to subtruncate to subattenuate, of variable length, unevenly distributed. stipe 23 - 50 × 3 - 6 mm, pure white, not changing when cut or bruised, narrowing upward, not flaring or only slightly flaring at apex, faintly longitudinally striate (lens), somewhat floccose or fibrillose (lens), with its surface occasionally breaking up into girdle-like formations, fragile; base rounded or obconic; context white, occasionally pale reddish brown in very base, unchanging when cut or bruised, solid to stuffed to hollow, in the latter cases with a central cylinder 1 - 1.5 mm wide; partial veil white, superior to median, membranous, fragile, small, often lost; universal veil as small cupulate or saccate volva, slightly greater than 1 mm thick at midpoint between point of attachment and topmost point of limb, pure white, somewhat leathery, not fragile, 7 - 13 mm from stipe base to highest point of limb, 5 - 8 mm across. odor/taste Odor of Russula adusta1 Fr. (Singer collection) or odorless (Tulloss 8-6-88-A & Tulloss 7-17-91-C). Taste not recorded. 1 Described by Kibby and Fatto (1990) as "often of old wine casks." tests Phenol - maroon (Singer collection). pileipellis 20± μm thick; filamentous, undifferentiated hyphae 1.5 - 5.5 μm wide, dominantly subradially arranged, tightly interwoven, partially to totally gelatinizing, with a slightly browner tint than adjacent pileus context; vascular hyphae not distinguishable. pileus context filamentous, undifferentiated hyphae 3.0 - 8.0 μm wide, occasionally up to 17.5 μm wide and then with walls thickened (0.5 - 0.8 μm thick); acrophysalides plentiful, thin-walled, ellipsoid to clavate to narrowly clavate, up to 68 × 39 μm; vascular hyphae 1.8 - 12.0 μm wide, common, branching. lamella trama bilateral, with wcs = 30 - 40 μm, with central stratum sometimes partially obscured by inflated or partially inflated cells of the subhymenium; with divergent elements exiting central stratum at a shallow angle, sometimes at an angle of about 45° or more to central stratum when reaching bases of basidia; filamentous, undifferentiated hyphae 2.5 - 6.0 μm wide, some with rather frequent swollen intercalary segments; divergent, terminal, inflated cells not observed; vascular hyphae 1.5 - 3.8 μm wide, locally common, branching; clamps present. subhymenium wst-near = 30 - 55 μm; wst-far = 55 - 60 μm; filamentous, undifferentiated hyphae frequently branching and short-segmented outside the central stratum; elongate, intercalary, subinflated to inflated hyphal segments frequent, sometimes in short chains, sometimes clavate, sometimes narrowly subfusiform to bacilliform, up to 75 × 21 μm, thin-walled, sometimes arising in central stratum and with major axis roughly parallel to same, curving away from the central stratum smoothly until reaching an angle of 30° - 45° to it and giving rise to short elements near the bases of basidia, with end nearest basidia sometimes recurved slightly; short hyphal segments (including a variable number inflated) dominant near basidia bases with many running at shallow angle to central stratum; in some regions, small inflated cells (up to 29 × 18.5 μm, but mostly smaller, e.g., 9.0 × 8.5 μm) locally dominant in three to six layers; with basidia arising from inflated cells or from the end or the side of an uninflated to partially inflated hyphal segment; clamps observed. basidia 24 - 56 (-67) × 8.0 - 14.5 (-15.5) μm, thin-walled, at times with base curved to one side, dominantly 2-sterigmate, occasionally 4- or 1-sterigmate, with sterigmata up to 13.8 × 3.8 μm; clamps and proliferated clamps prominent, frequent. universal veil On pileus: absent in material studied. At stipe base, exterior surface: a very thin layer of tightly interwoven hyphae with a few ventricose gaps here and there; filamentous, undifferentiated hyphae 1.5 - 7.5 μm wide, sublongitudinally oriented, often collapsing and slightly gelatinized; vascular hyphae 4.8± μm wide, scarce. At stipe base, interior: filamentous, undifferentiated hyphae, 2.2 - 7.2 μm wide, often in fascicles, plentiful; inflated cells dominating, terminal, single, subglobose to ovoid to elongate to ellipsoid to subpyriform up to 105 × 63 μm; vascular hyphae 4.0± μm wide. At stipe base, inner surface: like the interior except elements collapsed and gelatinized. stipe context longitudinally acrophysalidic; filamentous, undifferentiated hyphae 1.5 - 10.2 μm wide, dominating, branching; acrophysalides thin-walled, up to 191 × 47 μm; vascular hyphae common, 3.0 - 6.5 μm wide, branching; clamps common. extensively gelatinized; with surface having irregularly scattered pits (evidently due to loss of inflated cells) up to 56 × 36 μm; filamentous, undifferentiated hyphae with co-parallel orientation; internal inflated cells not observed; vascular hyphae not distinguishable due to gelatinization. Note: No tissue assignable to the partial veil could be located on specimens of the holotype. In his type study, Jenkins (1982) found “exclusively filamentous hyphae 3 - 8 μm diam.” The data presented here are from a flake on the stipe of Tulloss 8-6-88-A. Not reported in the 1993 revision by RET, from which the present text is taken. from type study of Jenkins (1982): [-/-/1] 11.7 - 13.3 × 7.8 - 9.3 μm, (Q = 1.42 - 1.60; Q' = 1.45), hyaline, thin-walled inamyloid, ellipsoid; apiculus sublateral, cylindric; contents guttulate; color in deposit not recorded. composite data from all material revised by RET: [204/10/5] (9.5-) 10.5 - 16.2 (-20.0) × (6.0-) 7.5 - 10.5 (-12.5) µm, (L = (11.3-) 11.7 - 14.5 µm; L’ = 13.1 µm; W = (8.1-) 8.6 - 9.7 µm; W’ = 9.0 µm; Q = (1.12-) 1.26 - 1.75 (-2.10); Q = (1.30-) 1.31 - 1.64; Q’ = 1.48), inamyloid, thin-walled, hyaline, smooth, ellipsoid to elongate, occasionally cylindric, sometimes subfusiform, usually at least somewhat adaxially flattened; apiculus sublateral, cylindric, often quite broad (e.g., 3.2 μm across); contents granular to guttulate; white in deposit. ecology Occurring in July and August, western North Carolina to eastern Massachusetts and Rhode Island, solitary to subgregarious, in grass near mature Quercus (Singer collection) or in packed loamy soil near Quercus sp. and Rhododendron maximum (Tulloss 8-6-88-A) or in pine-oak barrens dominated by Pinus rigida with several species of Quercus as scrub (Tulloss 7-17-91-C) or in mixed deciduous woods with Quercus present (Tulloss 7-25-92-D). The holotype was collected in mixed deciduous and coniferous forest. material examined from type study of Jenkins (1982): U.S.A.: NORTH CAROLINA—Watauga Co. - Blowing Rock, 19.viii-19.ix.1899 G. F. Atkinson 3711 (holotype, CUP-A). U.S.A.: CONNECTICUT—Litchfield Co. - Washington Twp., N of Washington Depot, Bee Brook Pk., 25.vii.1992 B. Eldering s.n. [Tulloss 7-25-92-D] (RET 066-1). MASSACHUSETTS—Suffolk Co. - Cambridge, Observatory Park, vii.1942 M. & R. Singer s.n. (FH; field notes in F). NEW JERSEY—Middlesex Co. - Jamesburg Twp. Pk., ca. Helmetta [40°23’07” N/ 74°25’48” W], 17.vii.1991 R. E. Tulloss 7-17-91-C (RET 010-6). NORTH CAROLINA—Watauga Co. - Blowing Rock, 19.viii-19.ix.1899 G. F. Atkinson 3711 (holotype, CUP-A). RHODE ISLAND—Washington Co. - near Kingston, 6.5 km S of University of Rhode Island campus, 6.vii.1988 Rick Van de Poll s.n. [Tulloss 8-6-88-A] (RET 045-2). discussion The investigations reported in the paper from which this text was derived (Tulloss 1993) were undertaken as a result of my finding a packet containing material of the present taxon marked "A. biovigera type" in FH. Dr. C. Bas, L, advised me that the name "A. biovigera" first appeared in (Singer, 1951 [“1949”]. Agaricales, 1st ed. : 387). 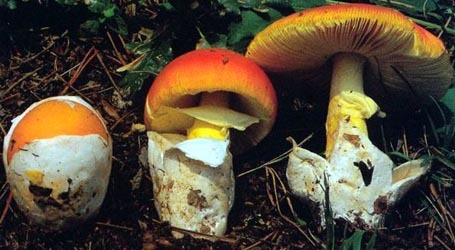 The citation is in a list of taxa assigned to Amanita section Ovigerae Sing. (=sect. Vaginatae) and consists entirely of the following: "A. biovigera Sing. [A. strangulata (Fr.) Quél. sensu Bres. non al.]." Dr. Bas pointed out to me that, because Bresadola's description was in Latin, the brief quotation just cited results in a valid publication of A. biovigera. Dr. Bas was very generous in sending me notes that he had prepared on the subject several years ago. He had examined potential syntypes of A. biovigera among Bresadola's collections at S and found this material to have 4-sterigmate basidia. The composite from his spore measurements is as follows: [25/3/3] (10.8-) 11.2 - 13.9 (-14.4) × (8.2-) 8.3 - 11.5 (-11.7) μm, (L = 11.7 - 12.9; L' = 12.4 μm; W = 8.6 - 10.4 μm; W' = 9.8 μm; Q = (1.07-) 1.08 - 1.45 (-1.51); Q = 1.18 - 1.35; Q' = 1.27). (It should be noted that the specimen with Q of 1.18 was annotated "juvenilis" by Bresadola.) The description of Bresadola (1927: 18 & Tab. XVIII) includes an umbrinous (but not dark) pileus 80 - 100 mm wide and a stipe 120 - 160 × 11 - 15 mm. [The color of the pileus in the accompanying plate is between Light Brownish Olive and Buffy Olive or a little lighter (due to uneven application of pigment in the printing process).] It became clear that A. biovigera cannot be the correct name of its apparently once-intended type. During a visit to F, I was shown and given permission to copy Dr. Singer's original field notes, which give a good account of the fresh material of the Observatory Park collection and support placement in A. pachysperma. Jenkins (1982) reported a study of the holotype collection of A. pachysperma that matches my observations on the Singer material in every detail except for the fact that basidial clamps had not been observed. Re-examination of the holotype revealed relatively common clamps and proliferating clamps. The holotype is in poor condition—reduced to fragments that are somewhat difficult to handle. For this reason, repetition of a complete anatomical study of the type was not attempted. Spore size and shape as well as the structure of the lamella trama and subhymenium were examined in the type and, along with macroscopic characters, were emphasized in determining the recent collections. 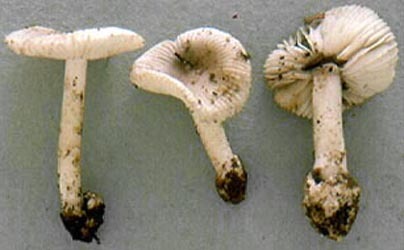 The shortest spores of any collection examined were those from Tulloss 8-6-88-A (L = 11.3 - 11.7 μm). Tulloss 8-6-88-A was collected during a dry, hot period in which the daytime temperature in Rhode Island regularly rose to over 38° C. The basidiomes of A. pachysperma are quite small and, as such, particularly liable to the impact of environmental stresses. It seems reasonable that such conditions might cause production of smaller spores than usual. In the same regard, Tulloss 7-25-92-D was collected in the wet and relatively cool July of 1992, the Q and L values calculated for this specimen (1.63 and 14.4 μm respectively) were the second highest recorded for both of the variables. amount of inflation in elements of the subhymenium (frequently, more elements inflated in A. pachysperma) and of the lamella trama (terminal, divergent, inflated cells absent in A. pachysperma). photo RET - (1) ca. Kingston, Rhode Island, U.S.A.
provisionally identified as: Amanita pachysperma G. F. Atk. select a collection to review/add spore measurements..#784287. R. E. Tulloss, #7-17-91-C, U.S.A., NEW JERSEY, Middlesex Co., Jamesburg..#829919. G. F. Atkinson, #3711, U.S.A., NORTH CAROLINA, Watauga Co., Blowing Roc..#829920. B. Eldering, #s.n.=>Tulloss 7-25-92-D, U.S.A., CONNECTICUT, Litchfield ..#829921. M. & R. Singer, #s.n., U.S.A., MASSACHUSETTS, Suffolk Co., Cambridge, O..#829922. R. E. Tulloss, #7-17-91-C, U.S.A., NEW JERSEY, Middlesex Co., Jamesburg..#829923. G. F. Atkinson, #3711, U.S.A., NORTH CAROLINA, Watauga Co., Blowing Roc..#829924. Rick Van de Poll, #s.n.=>Tulloss 8-6-88-A, U.S.A., RHODE ISLAND, Washin..